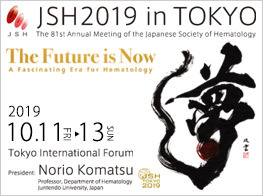 We are pleased to announce that abstract submission is open for the 81st Annual Meeting of the Japanese Society of Hematology to be held in Tokyo, Japan from 11 - 13 October 2019. The main theme is " The Future is Now - A Fascinating Era for Hematology - " and we have planned many English lectures and sessions. Please join to share your knowledge and expertise with colleagues from around the world! Please click here to submit your abstract by April 4, 2019. JSH Travel Awards, consisting of 100,000 JPY and free registration for the Congress, will be available for investigators under/including the age of 45 from Asian countries (except Japan) with accepted abstracts. This Awards aim to encourage young researchers in Asia to participate in the meeting that gives the opportunity to communicate and exchange ideas and knowledge with the Japanese delegates for their future potential collaborations. This message was sent by mail delivery software. Please do not directly reply to this e-mail address. You are receiving this email because you dropped by JSH booth at EHA and/or ASH Annual Congress.